Albany NY wedding photographers..The cathedral of the immaculate conception in Albany New York is among the most beautiful churches anywhere for a Catholic wedding ceremony...Depending upon the time of day or the time of year your wedding ceremony in Albany will be, there may be incredible, dramatic light filtering in through the cathedrals beautiful and massive stained glass windows. I always love photographing a full Catholic wedding mass along with the wedding nuptial. Jamie and Chris we're fortunate to have their wedding at a time of day where there was a beautiful light streaming in as they took their vows together in Albany. I always love to make wedding photographs that have a sense of place, that take in the whole scene of the wedding ceremony and help the couple remember how it felt as they stood together in front of their assembled guests. 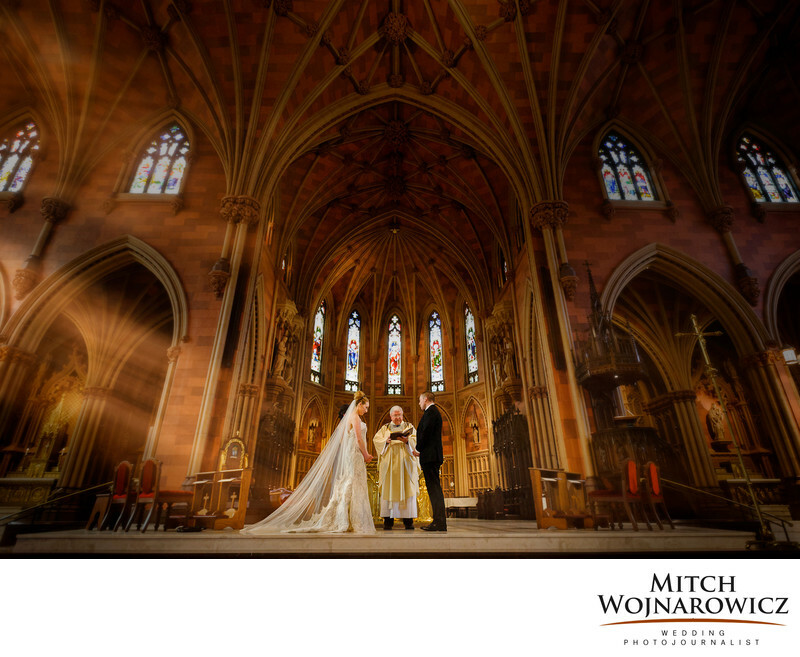 I also love to make a photograph for the couple that shows them what it look like from the audiences perspective!..So if you were looking for a cathedral of the immaculate conception wedding photographer please give me a call so that we may personally discuss your wedding. And even if you intend to have a very small and intimate wedding ceremony I have photographed a very small weddings in the Albany area that only had a dozen or so people in attendance. Whether your wedding is big and bold, or quiet and intimate, it is my type of an event...As a documentary wedding photographer and wedding photojournalist I'll bring home the pictures that will live on your walls and will live on in your lives together. If you would like some wedding planning tips and some ideas regarding what you should look for in hiring a wedding photographer get in touch with me today and I'll gladly help you start the process of finding your perfect wedding photographer whether you were looking for an Albany wedding photographer, a Hudson Valley wedding photographer or wedding photographers in the Adirondack Mountains.